A few weeks ago, the SAP Activate team shipped an update of the content and guidance for SAP S/4HANA Cloud 1711. With this release, we have made significant improvements to the Fit-to-Standard process that is critical for success of every SAP S/4HANA Cloud deployment. This blog post aims to educate you about the improvements and explain how they support project teams during deployment of SAP S/4HANA Cloud. 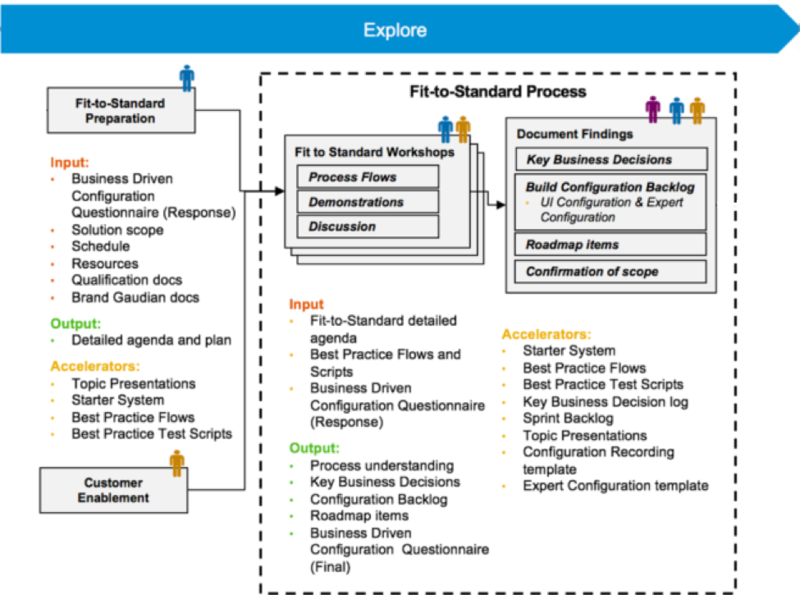 Business Driven Configuration brings business questions into the Fit-to-Standard process. 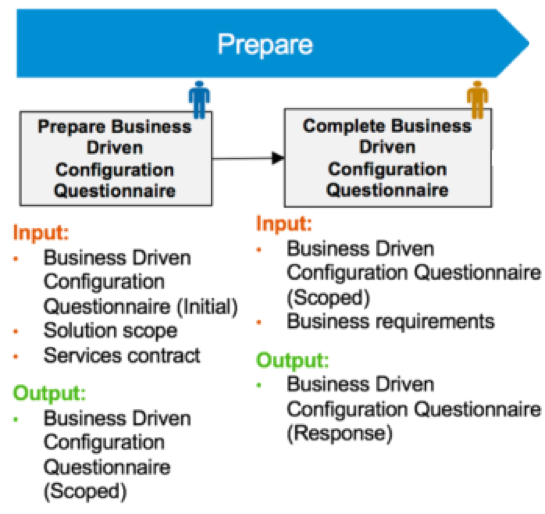 The business questions help business users and project teams make critical decisions to drive the configuration values for their solution. Let me document an example of how this works. We will focus on the activities which are performed in the Prepare and Explore phases of SAP Activate. The image below shows the process flow which I describe in the text below. During this phase, the consultants supporting the deployment adjust the set of questions by selecting those which correspond to customer’s chosen scope. Each question is assigned either to a scope item or functional area. This selection of questions is then shared with the customer business users to be prepared prior to the Fit-to-Standard workshop(s). The business users answer the questions along with being up-skilled on the solution functionality in self-enablement. Additionally, consultants may provide additional insight in case the business users have difficulty addressing the questions. The consultant collects the answered questions and uses them to prepare for the Fit-to-Standard workshops in the Explore phase. The answers to the Business Driven Configuration questionnaires provide insight into areas which should be in focus in each workshop and are used to probe questions in areas that need specific configuration values defined so the solution meets the customer’s needs. Once the workshops begin, the consultants follow the standard process for Fit-to-Standard (i.e. walk through the processes using the test scripts and process diagrams for scope items in the project scope). They deep dive into areas that have been determined critical, per the answers from the customer or understanding of the customer specific needs. And finally, once the decisions are made and confirmed, the project team determines the configuration values (including the self-service configuration apps that will be used to configure the solution). Note, depending on the scope of the project, there are typically multiple Fit-to-Standard workshops per each functional area to allow sufficient time to define the configuration needs. Once the configuration values are defined and the Explore phase activities are completed, the project team starts configuring the Quality System and conducts frequent transports of the configuration to Production System as we discussed in one of our earlier blogs regarding the Realize phase. To stay informed about this upcoming blog, make sure to follow me @janmusil. The blog post will appear in the SAP Communities space with tag #sapactivate, and will also be announced on the SAP Activate Methodology Jam space which you can request to join here. If you are interested in SAP Activate and deployment of SAP S/4HANA Cloud, I recommend you check out the recently released e-book: SAP S/4HANA Cloud: Implementation with SAP Activate from SAP PRESS. As always, let me know your thoughts and feedback either in the comments to this blog post, in the SAP Activate Jam space or on Twitter.